Hello Dealsnloot Readers,Bookmyshow as you know is used to book movies etc.Today we have have come up with a new offer in which you will Get Free Rs.50 BookMyShow WinPin on Completing Short Survey. Bookmyshow is offering Free Rs. 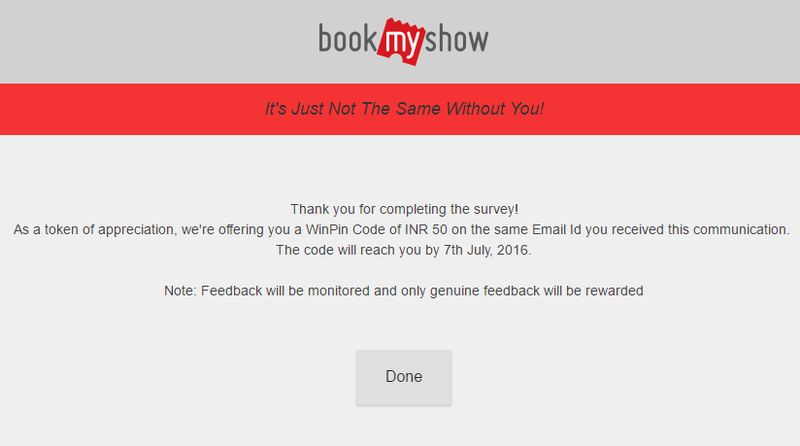 50 Winpin For completing Simple survey of Bookmyshow. For getting this offer you must give genuine feedback in short survey. After completing Survey You get free voucher in your email on 7th July 2016. You can use this winpin code to get off on watching movies . You get Flat Rs. 50 Discount on your order.So Hurry Grab This BMS Loot. Note :- Feedback will be monitored and only genuine feedback will be rewarded.You can take this Survey one time Only. 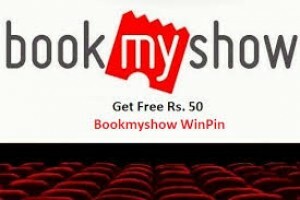 How to get Free 50 BookMyShow Winpin for Free ? 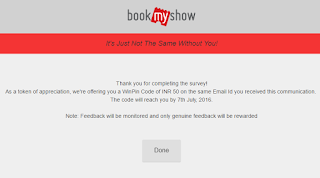 How to redeem the Bookmyshow coupon ? 3. Go through the regular ticketing flow for selecting the movie, cinema and show of your choice. 4. Confirm your email id & mobile number as this information will be used to confirm your transaction. Also, enter your card details on the “Payment Options” section. 5. Check “Avail Discounts & Offers” at the top left side of the payment details page, and select “Winpin“. Enter the 16 digit Code in the text box & click on “Apply”, and you receive the INR 50 off. 6. On the payment page select suitable payment option and make the payment. That's it ! To get Exclusive loot deals and Tricks on your Whatsapp instantly : Send "JOIN YOUR NAME" to +917758880994 Save Our No. In Your Contact List.